The scalp micropigmentation solution for hair loss is synonymous with the shaven look, able to flawlessly replicate a full head of shaved hair. However for some clients, the option to maintain longer hair and still camouflage their thinning is another great option. Not all clients are comfortable with the idea of shaving their heads. For some, they do not feel the style would suit them, or they may have restrictions placed on them by their occupation or the wishes of close family members. Whilst we find that most clients choose the shaven look, a style that they usually get used to very quickly, some do have the option to keep their hair longer if they are a suitable candidate to do so. Many women in particular choose this option, as do many of our male clients. If you would like to speak to our team about your options then give us a call on 0845 625 0025 and a member of our team will be able to advise and give you answers to any questions you may have regarding the procedure. 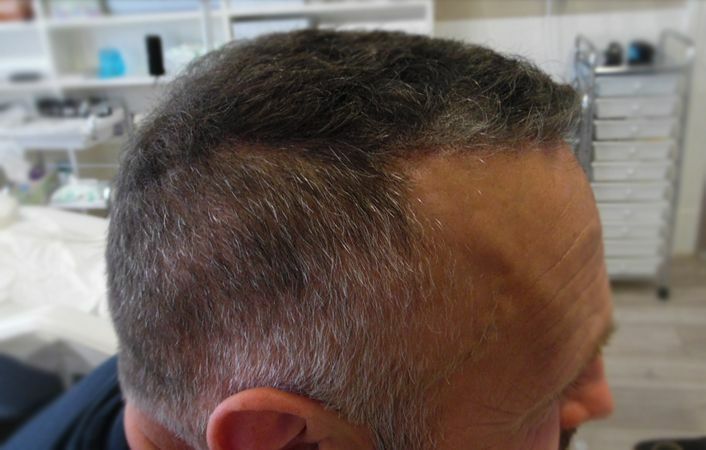 To keep your hair at a longer length after scalp micropigmentation, you need to satisfy certain requirements if an effective illusion is to be achieved. If you would like to get booked in for a consultation at one of our locations then you can call us on 0845 625 0025 or you can send us a message by clicking here and one of our team will be able to assist you and answer any questions you may have.